The kouprey was last seen in 1988, making this bovid one of the most endangered and mysterious large mammals in the world. It has an enormous but very narrow body, long legs and a humped back. Kouprey means ‘forest bull' in Khmer and its long and wide-reaching horns certainly create an imposing animal. Males' horns can reach up to 80 cm, branching upwards and forwards with frayed tips on animals over the age of three. Females' horns reach just 40 cm and spiral upwards. Adult males are dark brown to black whereas females are more grey in colour, and young start life a reddish colour, becoming greyish-brown by five to six months. 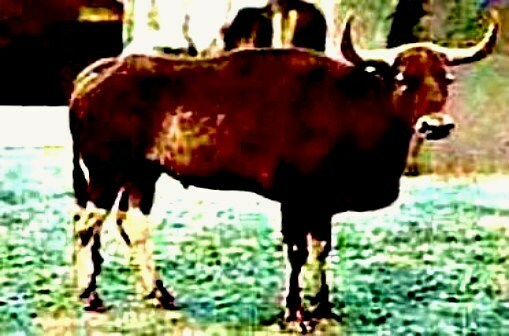 The tail is considerably longer than in either the gaur or banteng, and has a bushier tip. The lower legs are white or greyish. Males can be distinguished by their dewlap, hanging from their neck, which is unique amongst wild cattle.